I was very kindly sent a few items from Masque Bar a little while ago and I have been trialling them out for the past few weeks. 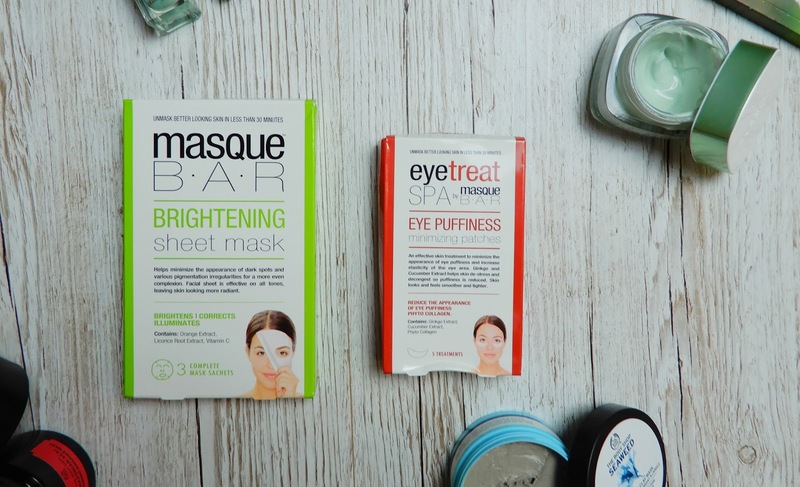 I must say that they have been amazing and I will definitely be buying more from Masque Bar. I love an easy way to look less tired and these products were my secret to keeping myself look refreshed and bright. I first tried the Brightening Sheet Mask, in one pack you get three masks. You apply it onto clean and dry skin and leave it on for 20-30 minutes. I tried this late at night to see how effective it would be on my dull, tired skin - I was impressed. I had a bit of difficulty applying it, I'm rubbish at applying these tissue masks and keeping them on. But I managed to keep them on of the 30 minutes and my skin looked brighter, cleaner and healthier. These masks contain Orange Extract, Licorice Root Extract, Vitamin C which led to your skin looking and feeling 10 times better after taking them off. These masks are great, if you'd like to purchase them, they are available at Boots for £9.99. The second item that I received was the Eye Puffiness Minimising Patches, I couldn't wait to get my hand on these as my dark circles are terrible - especially after my exams! 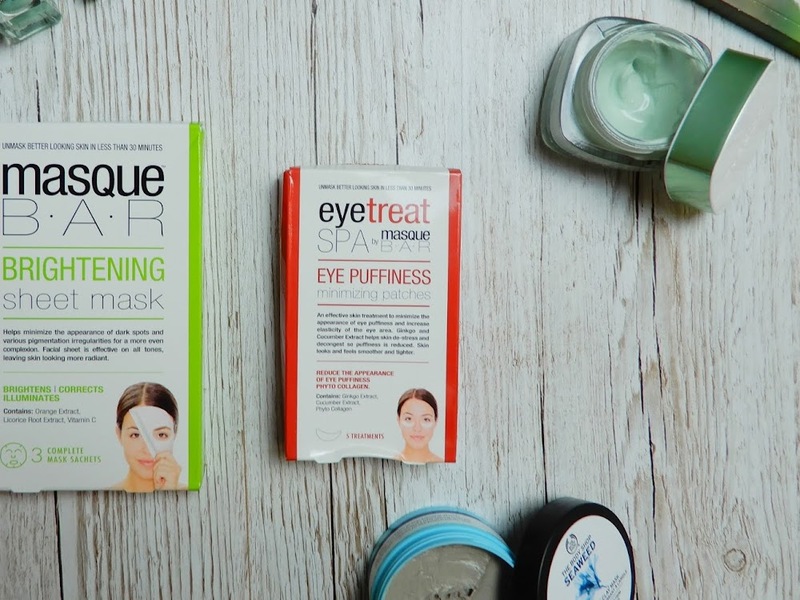 These are supposed to reduce eye puffiness (obviously - it's in the name) and increase the elasticity of the skin under the eye, they are meant to de-stress making your skin look smoother and tighter. They contain Ginko Extract, Cucumber Extract and Phyto Collagen which lead to the reduce in puffiness and tightening of the skin. I couldn't wait to have a go. They were super easy to apply, if I put them on slightly wrong then it was an easy peal off and place back on. You are supposed to leave them on for 30 minutes, peel them off and wash off any residue. I was very happy when I took them off, the area around my eyes looked hydrated and bright- even better, my dark circles had significantly reduced! You get 5 of these in a pack, it looks like I'll be buying lots off them in the future. You can purchase these from Boots for £9.99. I was also sent another product but I have saved that one for a giveaway including a lot of other skincare ranges. Keep an eye out on my Twitter account for that! What sort of products do you like to use to reduce the appearence of tiredness? 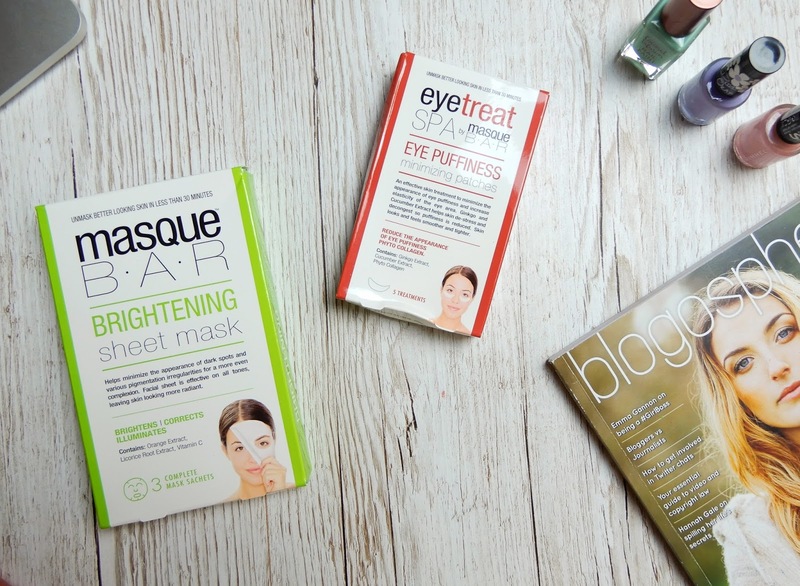 These products were sent, courtesy of Masque Bar, for reviewing purposes. These sound really good! I am definitely going to have to check them out when I next go to Boots! I am definitely going to have to get these! These look great. I love using Dr. Organic face cream to reduce my dark circles, it also clears up my skin well. Oooo! I've never tried Dr. Organic before, I'll have to give them a go!